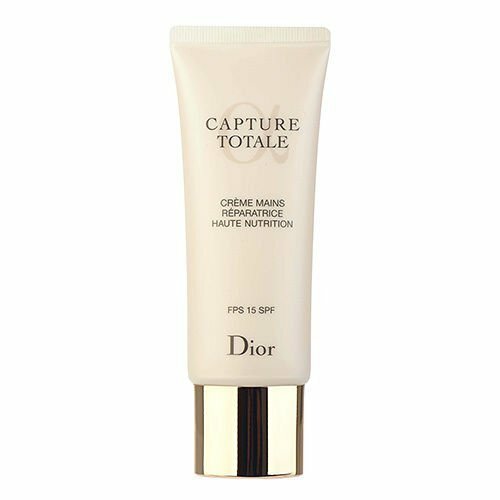 Description: Christian Dior Capture Totale Nurturing Hand Repair Creme FPS 15 SPF intensely corrects all visible signs of aging of dry hands and prevents the appearance of dark spots. At the heart of its formula, it contains a precious, deeply nourishing plant oil that instantly soothes dry hands. Christian Dior Capture Totale Nurturing Hand Repair Creme FPS 15 SPF leaves skin infinitely soft and even, restoring the hands嚙踝蕭 youthful beauty. The rich and silky texture renders ideal protection and absolute comfort. How to use: Apply and re-apply anytime when needed.